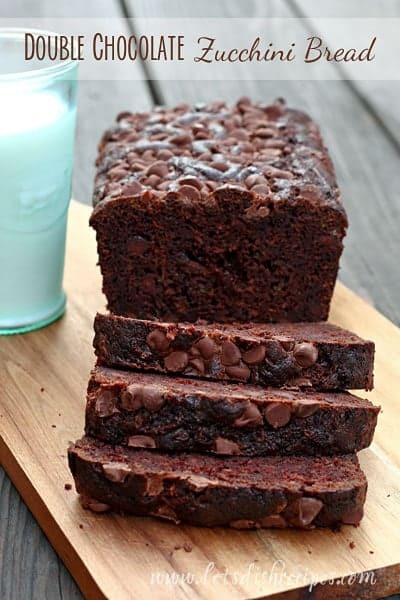 BEST CHOCOLATE BANANA BREAD — This moist, decadent chocolate banana bread will become your favorite way to use up over-ripe bananas! I’m of the opinion that everyone should have a good, basic banana bread recipe in their repertoire. 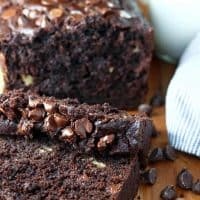 After trying this Best Chocolate Banana Bread, I’m also of the opinion everyone should have a good chocolate banana bread recipe in their collection too! Honestly, this stuff was more like cake than bread. But it has bananas in it, so it’s at least kind of, sort of good for you, right? With a big glass of cold milk, this moist, dense banana bread was a perfect after school snack for my hungry teenagers. It’s also a pretty great breakfast, and dessert too! 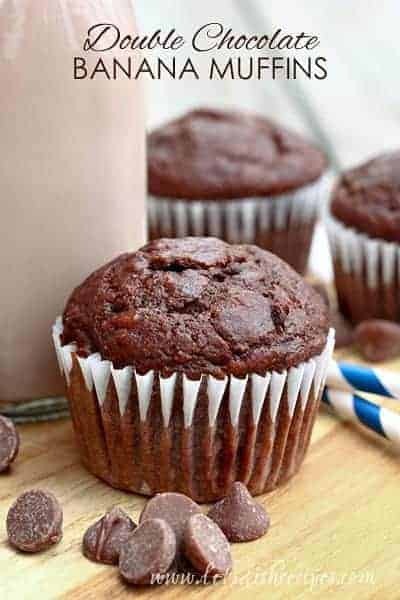 Chocolate and banana are a classic flavor combination, and they come together pretty perfectly in this easy to make quick bread. To get a really rich, dark chocolate loaf like the one pictured here, you’ll want to use Dutch process cocoa powder. But regular cocoa powder will work just fine too. And don’t forget that generous sprinkling of chocolate chips on top of your bread. That’s one of my favorite parts! Don’t worry, there are chocolate chips inside the bread too. I really can’t get over how good this bread was. My family wholeheartedly agreed. This loaf disappeared pretty quickly at my house. But I’ve always got loads of over ripe bananas, so next time I’m just going to double the recipe. Tip of the day: you can store your brown bananas in the freezer until you’re ready to use them. Just throw them in, peel and all. Then let them sit on the counter at room temperature for about an hour before you plan to use them. 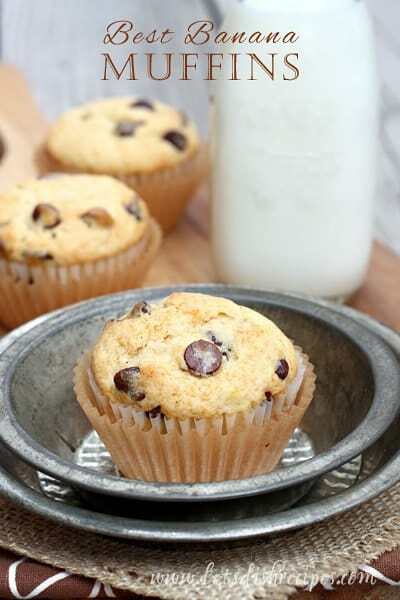 Then you’ll always have ripe bananas handy for making this delicious bread! 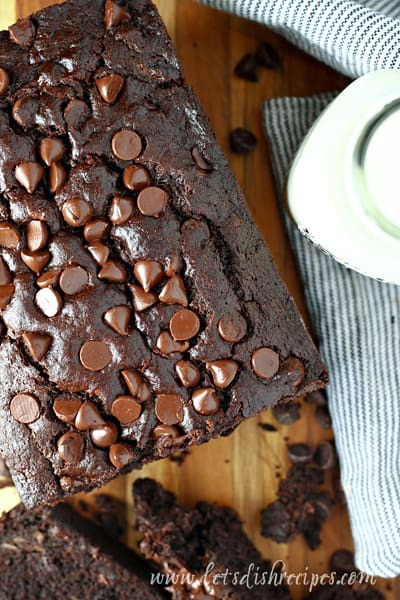 Be sure to save this Best Chocolate Banana Bread recipe to your favorite Pinterest board for later. 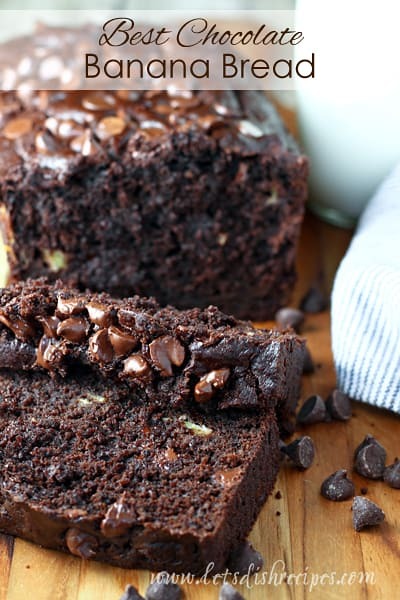 This moist, decadent chocolate banana bread will become your favorite way to use up over-ripe bananas! Preheat oven to 350 degrees. Generously grease a 9-by-5-inch loaf pan with nonstick cooking spray and set aside. In a medium bowl, whisk together the flour, cocoa powder, baking soda, baking powder and salt. In a large bowl, combine the bananas and oil and stir until combined. Add the brown sugar, egg, sour cream and vanilla and stir until smooth. Add the dry ingredients to the wet ingredients, and stir gently until just combined. Don’t overmix. Stir in 3/4 cup of the chocolate chips. Pour batter into prepared pan. Sprinkle the remaining 1/4 cup of chocolate chips over the top of the bread. Bake for 50-65 minutes, or until a toothpick inserted into the center of the bread comes out clean. (You may still have some chocolate on your toothpick from the chocolate chips). Remove the pan from the oven and set on a wire cooling rack. Allow bread cool in the pan for 10-15 minutes before turning onto the wire rack to cool completely. Just made this tonight — WONDERFUL! Probably not the MOST healthy, but then again, it’s got eggs, dairy, grain, fruit… A complete meal (and well-balanced if you put a slice in each hand!). Definitely a keeper!